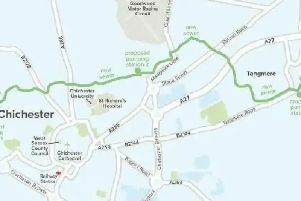 Should entire A259 be a dual carriageway between Bognor and Chichester? Completely dualling the A259 between Bognor Regis and Chichester to reduce the ‘human misery’ endured by motorists should be a priority, according to one councillor. Labour’s Michael Jones suggested the route was often treated as the ‘poor relation’ to the A27, despite having a greater effect on the county’s coastal towns. During a discussion on the Government’s plans to create a countrywide major road network (MRN), he suggested it could provide an opportunity to bid for extra funding. One proposal would be to dual the A259 between North Bersted and the roundabout with Drayton Lane. He suggested queuing on the single lane towards Chichester was ‘enormously irritating’ and raised the ‘time and effort and human misery expended on that road’ by motorists. His comments came during a West Sussex County Council environment, communities and fire select committee meeting on Friday (March 16) discussing the authority’s draft response to the MRN consultation. The strategic road network, which includes the A27, is managed by Highways England. A Government consultation on creating a MRN, which will lead to dedicated funding from the National Roads Fund to improve the middle tier of the country’s busiest and most economically important local authority A-roads, closed on Monday. The MRN as originally proposed includes the stretch of the A259 between North Bersted and Chichester. However the county council’s response suggests the inclusion of the A259 as far as Worthing, the A284 between Wick and the A27 as well as the A29 from Bognor to Fontwell. What do you think? Email the newsdesk.